Although I’d promised to go to My Tho with my sister, Kendra, I ended up going with my friend Des. She’s recently learned about pho, and if there ever is someone who loves the stuff, it’s Des. She’s an enthusiast. In fact, when Des walked in, the server knew her, and knew what she wanted. I ordered my usual, steak. Hey, why should I veer off course if I know what I like? Oh, and, of course bread. 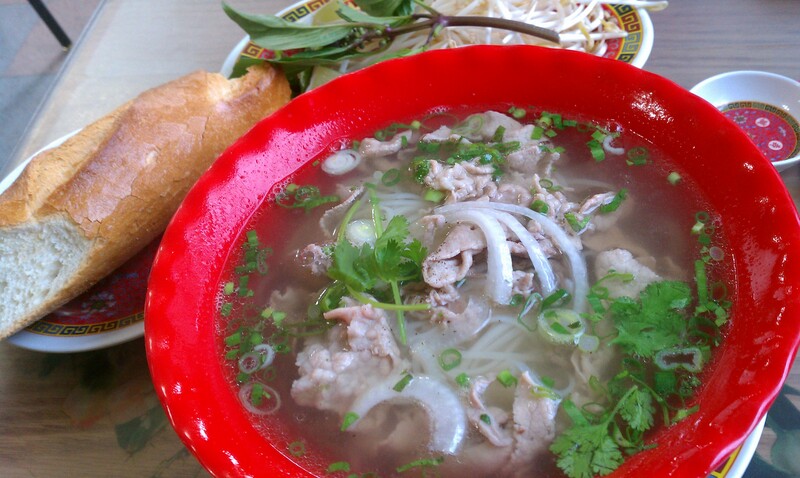 As I already mentioned, the bread was what made me want to post for the third time about pho. And I knew I’d probably like the bread since I hand banh mi at Pho Hot and loved it! I hate to say it, but I was right. About me loving the bread with the soup. Not that the bread with the soup was my idea or anything. Just that I thought I’d love it and I did. Sheesh. Why am I getting all defensive? And the good thing is, lunch was inexpensive, fast, and delicious. And that pho will sneak up on you. Well, maybe it’s the lethal broth soup with noodles and a loaf of bread. But who’s judging? If you haven’t had pho, I’ll give my honest review of the three places I’ve had it. I think I liked To Chau or Pho Hot Bistro the best, and I’ll tell you my two reasons. I like it when my meat comes raw on the soup and the soup cooks it. The bowl I got at My Tho the meat was already cooked. So I couldn’t give top notch there. The pho at Pho Hien Noodle Soup Company was delicious, but their menu was very limited (read: only pho). To Chau and Pho Hot both have extensive menus, EXCELLENT service (I’m not sure I’ve had better service anywhere in Wichita than those two places), and delicious soup. Pho Hot Bistro gets extra points for their ambiance. They have a patio, a very clean restaurant (in the defense of the other locations, their location is the newest), and I know they serve alcohol. Ever had beer with pho? If not, add it to your bucket list. And My Tho gets mad props for the very reasonably priced bread add-on option. Anyway, this is all not to say I wouldn’t visit any particular one again. None of them were bad. They all had good service. I just felt like it might be appropriate to mention which of the four I’d personally give top ranks to. And in fairness, Des has had pho at a few different places and she picks My Tho as HER favorite. What about you? What’s your personal favorite? My Tho is one of the few things I miss about moving. It was only a few minutes from my house. But, I’d travel to eat there again!